Movement is a new El Primero 4003 Caliber with automatic chronograph movement and perpetual calendar, COSC certified. It has 31 jewels, beating at 36’000 vibrations per hour. Power reserve is over 50 hours. It has automatic winding in both directions. Central rotor on ball bearings and a 22-carat white gold oscillating weight with “Côtes de Genève” decoration. Functions are hours and minutes in the center, small seconds-hand at 9 o’clock. The perpetual calendar has the date at 3 o’clock, the moon phases at 6 o’clock and the day at 9 o’clock with the month and leap year at 12 o’clock. 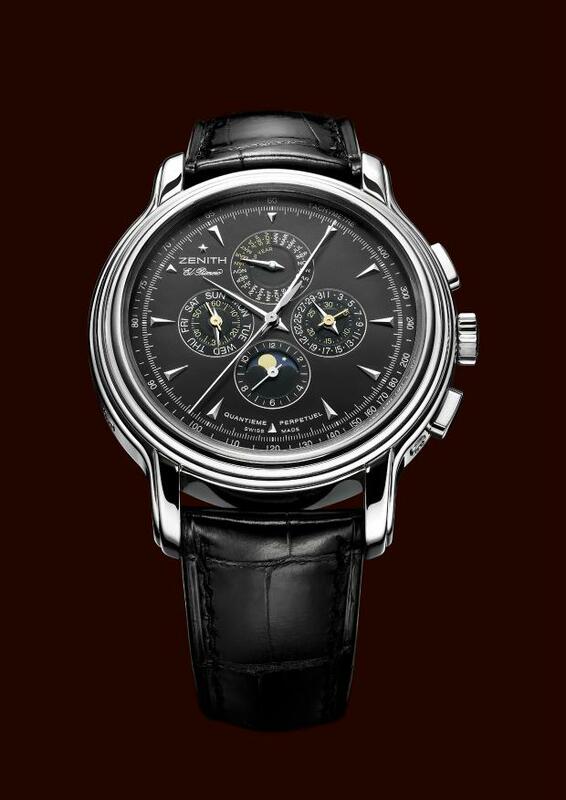 The chronograph function has a center seconds-hand, a 30-minute counter at 3 o’clock, a 12-hour counter at 6 o’clock and a tachometric scale on the dial.